In a medium mixing bowl, stir together the graham cracker crumbs and melted butter until evenly coated. Press mixture into a greased 9-inch pie plate. Bake for 8-10 minutes. In a medium saucepan, whisk together cream and milk. Warm over medium-low heat. Add in chocolate and stir until chocolate has completely melted and is smooth. Slowly add in vanilla and whisked eggs, and whisk until smooth. Pour chocolate filling into baked pie crust. Bake for 15-20 minutes, or until chocolate filling is set and does not jiggle when pie is lightly shaken. Remove from oven. Using a kitchen shears or a knife, cut marshmallows in half. Place halves in concentric circles over the top of the pie until covered. Lower oven rack to the middle position, and set oven to the lowest broil setting. Place pie on the rack and lightly toast the marshmallows. (I recommend pulling them out the second you see them beginning to turn slightly golden.) 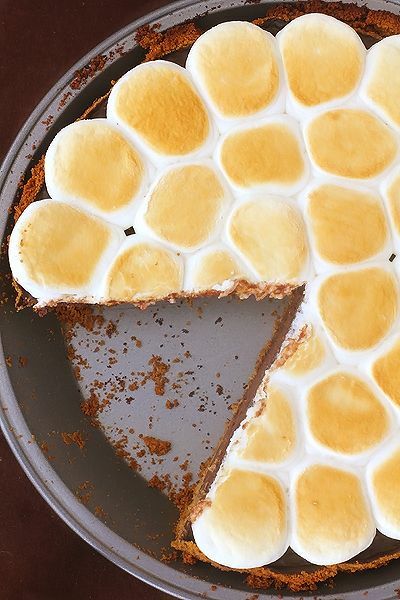 You can also use a kitchen torch to toast the marshmallows instead. Chill pie in the refrigerator to set for 2-3 hours. Or it can also be served slightly warm. Drizzle with chocolate sauce if desired.